On the brink of the French Revolution, Andre-Louis Moreau is a cynical lawyer living in Brittany who doesn't care about politics AT ALL. His bestie, Philippe, does however, and is very involved with the political reformers of the literary cabinet. One night, the highest-ranking noble in the area, the Marquis de la Tour d'Azyr, provokes the egalitarian Philippe into a duel and kills him because he possesses a "dangerous gift of eloquence." After witnessing the murder, Andre-Louis swears to speak with the voice of his dead friend and seek justice through the destruction of the Marquis and his entire class. But how far will he go in his quest for vengeance? I love Scaramouche! I really want to live in this novel. It's full of fabulous characters, adventure, romance, and it is definitely unputdownable. If you like reading about theater, history, men with gigantic feathered hats who bow over a lady's hand, sword fights, revenge tales, anything by Alexandre Dumas--The Count of Monte Cristo, The Three Musketeers, etc.--or a great story, you should definitely pick this book up. Even if you don't, I still think you should read it. What is a Scaramouche? you might be asking. Scaramouche is an olde-timey stock character from the Comedie Italienne, kind of like Harlequin. After Andre-Louis stirs things up in Rennes and Nantes, he has to get away from the local heat for a while; so he joins a troupe of players, where he takes on the role and the name of Scaramouche. What makes it a good name for him is that, as soon as he sets out to get justice for Philippe, Andre-Louis is playing a role--that of his friend, of Scaramouche, of a politician, etc. This is definitely an all-the-world's-a-stage sort of book, and Andre-Louis is pressed by necessity into taking on these roles; but there's also a sense that he doesn't know who he is (literally or figuratively) or what he wants until the end of the novel. There's also a lot of conflict between generations in Scaramouche, which makes the Revolution the perfect setting for the story. Wherever Andre-Louis goes, he meets old men who are like, "Listen to your elders, young sir! That's not the way we do things around here. *huffle huffle huffle*" But Andre-Louis has his own ideas of the way things should be done (which are naturally much better than the old guys'), and the energy to put those ideas into the practice. In the same way Andre-Louis is inevitably going to get his way, France is going to fall to the force revolution. But all that is just happening in the background. The center of the story is Andre-Louis, who tends to do bad things for the right reasons, and always seems to land on his feet. He's a strange mix of opposites--sarcastic and earnest, canny and dense, idealistic and unforgiving--but always likable and sympathetic. Rafael Sabatini takes every opportunity of making light of the people Andre-Louis meets--judges, politicians, writers, actors, academics--and it really is funny. You don't need to know anything about the French Revolution or the 18th century to recognize these characters and the humor and irony in Sabatini's prose. As for the female characters, they wouldn't pass the Bechdel Test--this is definitely a male-centric book, and all the women fill the role of either mother, saint, or whore (in fact, that perfectly summarizes the three major female characters in this book)--but I did like all of them. They're all women who behave true to their class, but with their own motivations, and are pretty independent. Basically, Scaramouche has everything you could possibly ever want in a novel. Have I mentioned you should most definitely read this book? You should. 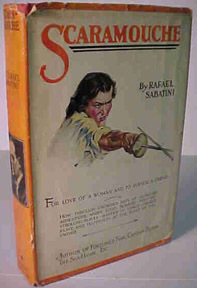 You might also be interested in Alex's review of Captain Blood by Rafael Sabatini here.